Fire service personnel must prepare for and respond to emergencies that are diverse and challenging. This includes routine responses that are considered high frequency, but low risk, as well as the low frequency, high risk category of responses, such as hazardous materials (HAZMAT) emergencies. 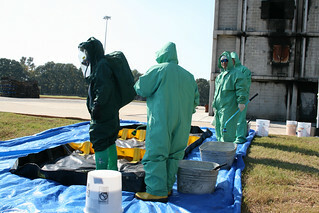 To prepare fire department personnel to successfully cope with HAZMAT response and ensure firefighter and community safety, GPSTC’s Georgia Fire Academy offers a Hazardous Materials curriculum that teaches fire service personnel to perform at two different and critical response levels: defensive and offensive. From analyzing the initial scene to incident mitigation, the Hazardous Materials curriculum fully trains responders to handle these events. Upon successful completion of this curriculum, students will be eligible to take the Georgia Firefighter Standards and Training Council’s tests for ProBoard Certification as defined by NFPA 472, Standard for Competence of Responders to Hazardous Materials/Weapons of Mass Destruction Incidents. Students seeking to enroll in the Hazardous Materials curriculum should be responsible for responding to known or potential hazardous materials/weapons of mass destruction releases. Students who have completed all courses or their equivalent become eligible to test for Hazardous Materials Certifications through Georgia Fire Standards & Training Council (GFSTC). Pre-requisites are defined by the Council and testing for Certification is separate from the training courses. For more information on testing, please contact the Georgia Firefighter Standards & Training Council at (478) 993-4521.